Miscellaneous Environmental Projects: GECO provides comprehensive Geographic Information System (GIS) and CADD products and services to our clients. Our capabilities enable us to provide high quality site plans and visual representations of data that are critical to thorough reporting, planning and decision making. In addition, GECO has experience with the Environmental Management System (eMS) and has provided clients with training and implementation support. Our goal is to assist clients with implementing and maintaining an effective eMS program while enhancing mission readiness. GECO provided instruction and training materials for two-day hazardous waste and spill prevention training events. Attendees included MTC Fort Pickett staff, tenants and personnel from all NGVA facilities statewide. 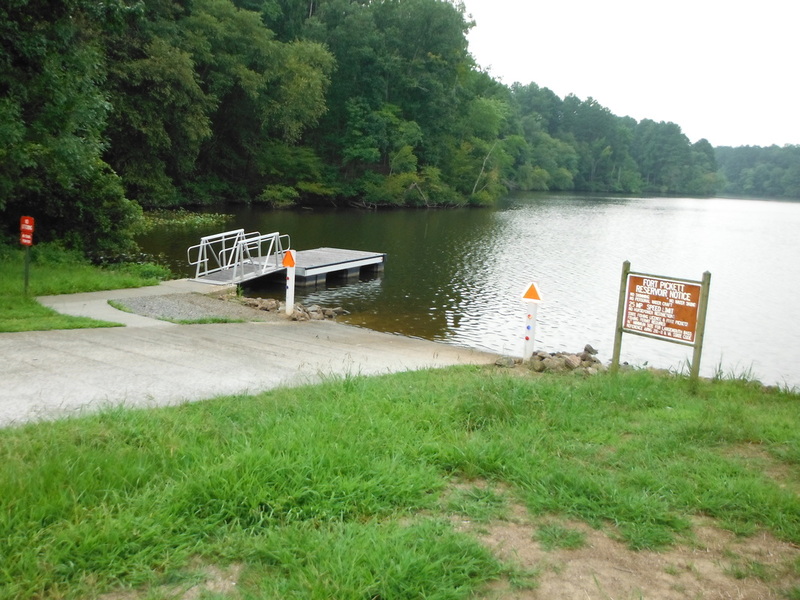 GECO was contracted to create a new concrete boat ramp 16’ x 55’ in accordance with VA Department of Game and Inland Fisheries recommendations for construction methods. In addition, the project included the placement of a handicap accessible floating boat dock, new signage and the repair of disturbed areas. 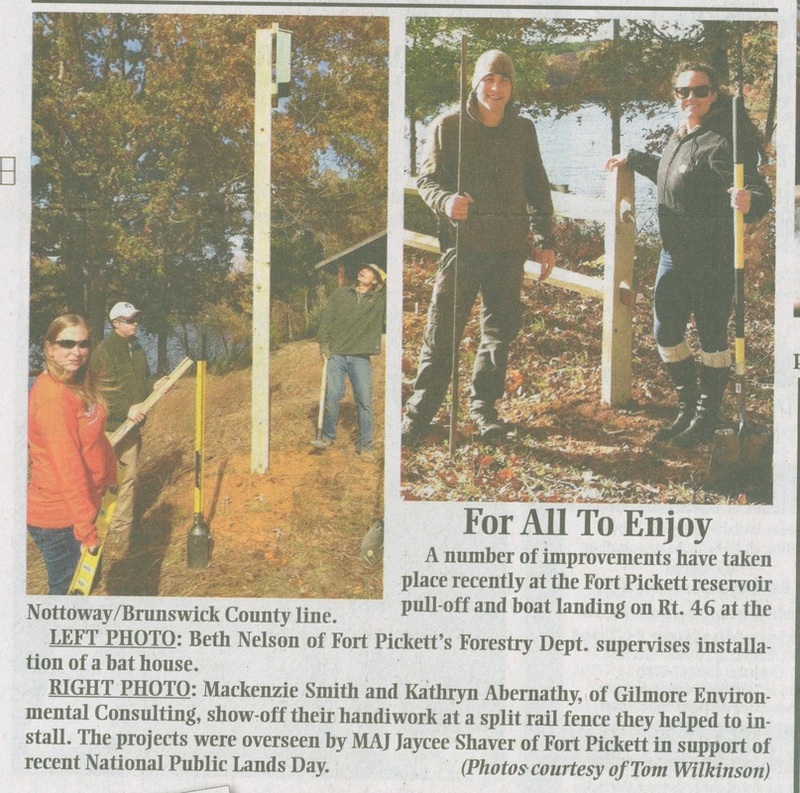 Left Photo: GECO personnel assisting Fort Pickett and DMA staff with improvement project at the Fort Pickett Reservoir boat landing. This work was in support of National Public Lands Day. This article appeared in the November 19, 2014 edition of the Courier Record. GECO personnel have extensive knowledge with NGVA and MTC Fort Pickett GIS systems, databases and requirements. Our staff has completed numerous mapping projects including the production of a detailed map displaying locations of all tree stands on MTC Fort Pickett, maps displaying the Trimble Road Landfill and historical comparison maps of the Dearing Road Landfill. Our mapping and GIS data include GPS located features with specific attention paid to accurate and complete metadata. We have full-size, color printing capability at our local office. In addition, our staff has provided numerous training opportunities to DMA staff for effective use of ESRI Software and DMA's Enterprise GIS system. GECO has extensive experience conducting Phase I Environmental Site Assessments for a variety of clients. GECOs Phase I ESA meets and/or exceeds the requirements of ASTM E1527-13.